The combination module B1-9 In Search of Adventure (that’s an affiliate link, giving me a commission on any sales) is kind of like a Pathfinder Adventure Path for Basic D&D. I can actually hear OSR people wince as they read that, but it’s kind of true. It links all of the “best bits” of the classic B-series modules for Basic D&D together. It doesn’t do this in a straight “only one path” order, fortunately, and actually starts with module B9 or B7 first. Since I am soon going to run a virtual tabletop Basic D&D game via Roll20 for players who are new to Basic D&D (and in some cases, new to D&D period), I want to give them the definitive Basic D&D experience. This is why I’ve selected the “best of the B series” combination module. Virtual tabletop play demands a bit more in terms of preparation. Since you’re not sitting around a real table together, visual aids become more important, at least in my experience. I’m also not trying to recreate just any Basic D&D experience, I am trying to recreate the feeling of the 1991 Black Box which introduced me to D&D. Those who can remember that version of the game might remember the large fold-out map of Zanzer Tem’s dungeon. In effect this was a large battlemat and the other modules which came out for this version of the game tended to include similar fold-out maps. Long story short – I want maps I can display on the screen in “battlemat” scale (1 inch square = 5′ square). There are, fortunately, some great such maps already made available online and quite frankly almost everyone is better at making pretty maps than me so some of these I have already been able to find. Some are even available commercially – I may review these as separate posts. But for others I will have to make my own VTT versions of these maps. If you are like me and would rather spend your time playing, then I will post these maps as I draw them in the hope that they will be helpful to you. 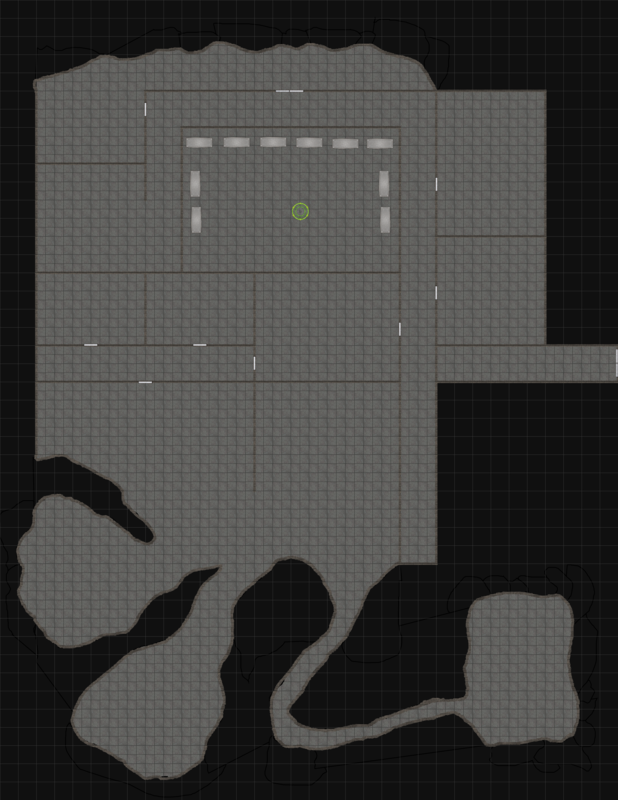 Here is the Castle Caldwell dungeon level, made in Dungeonographer. This is a player map – you will need the referee’s map from the module (p133) to use it. It is not quite in native Roll20 scale but can be easily resized to Roll20 and since it is fairly plain doesn’t really lose anything in being resized anyway. 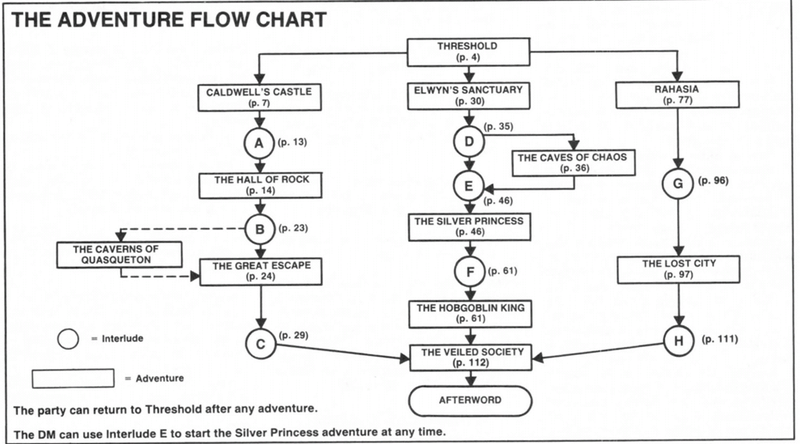 A player map for “The Dungeons of Terror” originally from B9, adapted from p133 of B1-9 In Search of Adventure. It’s functional, not pretty.